Spiders freak out a lot of people. And it makes sense. Arachnophobia isn’t a needless fear by any means. Psychologists believe that a big reason why so many people are afraid of spiders is because of at least one experience in life that justified that fear. This “conditioning” view of arachnophobia is pretty understandable. Also, fears of certain kinds of animals are believed to represent a functionally distinct set of responses that are adaptive that are directly tied to the evolutionary history of humanity. That’s right– it is believed that we have inherited this fear from our ancestors. But most spiders are far from bad. In fact, spiders can be nature’s pest control. In Mesa Arizona, there are plenty of spider types that are definitely worth being afraid of, especially the black widow spider that can be deadly. But most spiders that inhabit our homes keep to themselves, and help us out with pest control as well. Those spiders could take over for your pest control company for a while, but there is the risk of those helpful spiders becoming the pest. Spiders often eat flies and other insects that plague our patios and indoor spaces. In doing so, spiders provide us with a pest control service. They are also very important to our ecosystem as well– spiders often feed on the most common species of insects in an area and in doing so prevent other species from becoming dominant. Spiders are immensely important to local ecosystems. While the above paragraph is true, spiders can also become a serious problem that may require the need for a pest control company to take care of them. Spiders unfortunately become a pest fairly quickly, as they usually don’t leave a space after it has been sapped of all other pests or pest control issues. Spiders can become a problem for many reasons. First of all, they usually leave messy, sticky, ugly-looking webs behind and make fresh ones often. This means that your room’s corners, your kitchen drawers and cabinets, and the veranda in your backyard could become unsightly and uncomfortable for guests (and you) to be around. The overwhelming presence of multiple spiders in the home is also setting up for your quality of life to be compromised. Nobody, even those who aren’t scared to death of spider, is comfortable knowing that one may be crawling on them or crawl out of something in sight at any given time. That opens the door to an anxious living situation. It is nice that spiders take care of those pesky flies and annoyingly loud crickets– but they have definitely overstayed their welcome when they begin to infest the place. But what should you do if spiders begin to take over your house? There are a few things you can do before calling a quality and professional pest control company like Varsity Termite and Pest Control. If you’re spotting quite a few spiders around your home, there’s a chance that there are egg sacs around as well. Spiders often leave their egg sacs in very dark hidden corners or spots in any space. Try giving your home a vigorous vacuuming, including not just your carpets but your wall corners, baseboard, under sofas and other furniture, and other spaces where spiders may be hiding. Remove as many webs and tiny pockets of egg sacs as you can before disposing of your vacuum bag. Spiders, like many arachnids and insects, are attracted to light. Try switching off some of your outdoor lights for a while until your spider problem is solved. Just as well, get rid of certain things where spiders may be infesting their first home– your backyard. Those spiders come from somewhere, right? Clean up leaf piles and firewood stacks in your backyard to deter spiders from moving into the backyard and eventually moving indoors. Sticky traps are another handy measure for getting rid of spiders. Try placing ten to twelve sticky traps, available online and at hardware stores, around your home. Sticky traps won’t completely solve your spider problem, but they will lure remaining spiders in your home to the spider-summoning formula in the tape and get rid of some of the remaining spiders in your residence. Like all pests, spiders have to get into your house somehow. Check around your house for holes in the wall, loose outlets, poor sealing around your doors, and gaps in your windows. Seal up these holes and effective remove your unwelcomed guest’s entrance into the home. While all of these steps are helpful, your spider problem may still persist. 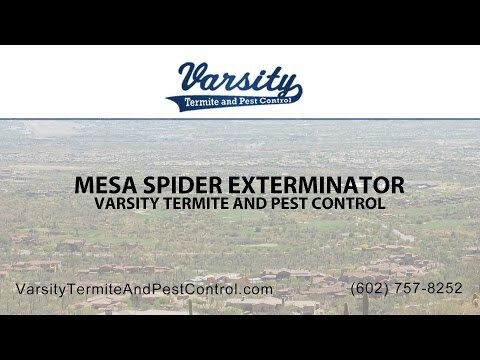 If that is the case, it may be time to call a good Mesa pest control company to have professional spider exterminator in Mesa take care of the problem and prevent it from happening in the future. I have a spider problem in my Mesa, Arizona home. Who should I call? Varsity Termite and Pest Control is a great choice for pest control in Mesa. Varsity Termite and Pest Control is a pest control company that has been family owned and operated for over two decades. Whether you have a spider problem or another pest problem, the talented pest control technicians and specialists at Varsity Termite and Pest Control can help you with your infestation problem. Give us a call today for a quote and more information on how we can help you rid your life of pesky pests in your home.